Extension sounder with 45 Ohm speaker in a wall mountable white ABS plastic box. 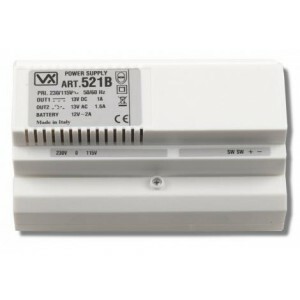 Requires an externa..
- Extension Sounder for digital system VX2200.- Is connected directly to the “2 Wire Bus”.- ..
Includes connection PCB. This part is supplied separate to the videophone to allow first fixing on i.. Flush backbox kit for eclipse monitors. Kit includes surface frame mounting rails and backbox. ..
- Flush mounting kit (for dry line walls) for hands-free eclipse video monitors (except Art.5412) co..
Speaker module for 800 series kits- 0/1/2 button amplifier module for the EK range of kitsTh..